Abbey D’Agostino of the United States (R) is assisted by Nikki Hamblin of New Zealand after a collision during the Women’s 5,000-metre Round 1 - Heat 2 on Day 11 of the Rio 2016 Olympic Games at the Olympic Stadium on August 16, 2016 in Rio de Janeiro, Brazil. When American runner Abbey D'Agostino clipped New Zealander Nikki Hamblin while running in a qualifying heat of the 5,000-metre race, they both went sprawling. D'Agostino was the first to get up, but she didn't leave her competitor behind. Instead, she offered a hand and said, "Get up. We have to finish this." It was a great Olympic sporting moment, showing the world it's just as much about finishing as it is winning medals. Here are some other memorable moments exemplifying the Olympic spirit. Justin Wadsworth, head coach of the Canadian ski team, lends a hand to Russian Anton Gafarov who had fallen and broken one of his skis at the Sochi Olympic Games on February 11, 2014. During the men's cross-country sprint in the mountains above Sochi, Justin Wadsworth, the head coach of the Canadian team, ran onto the course to help Anton Gafarov, a Russian skier who had fallen three times and broken a ski. "I was on the course with spare skis and poles for Alex [Harvey, a member of the Canadian team that didn't qualify for the sprint final]," said Wadsworth. "I just went to watch. The Russian fell on the big downhill before the finish area and broke a ski. I was surprised no one else on the course gave him anything. "I went over and gave him one of Alex's spare skis. It was about giving Gafarov some dignity so he didn't have to walk to the finish area." 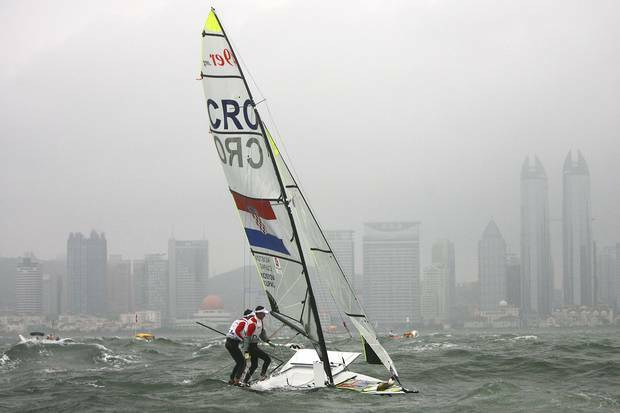 Jonas Warrer (rear) and Martin Kirketerp Ibsen of Denmark take to the sea in a spare boat borrowed from the Croatian team as they compete in the 49er class race held at the Qingdao Olympic Sailing Center during day 9 of the Beijing 2008 Olympic Games on August 17, 2008 in Qingdao, China. Danes Jonas Warrer and Martin Kirketerp were comfortably leading the 10-boat pack going into the final round of the 49er class sailing competition, needing only a seventh-place finish to wrap up the gold medal. But shortly before the race was about to start, their mast broke. They were unable to repair it in time and their gold medal dreams seemed to be over. That's when two Croatian sailors, Peter Cupac and Ivan Bulaja, who were in their hotel room about to watch the race as they hadn't made the final, lent their boat to the gold medal hopefuls. The Danes would go on to finish seventh in the round, giving them the gold medal. 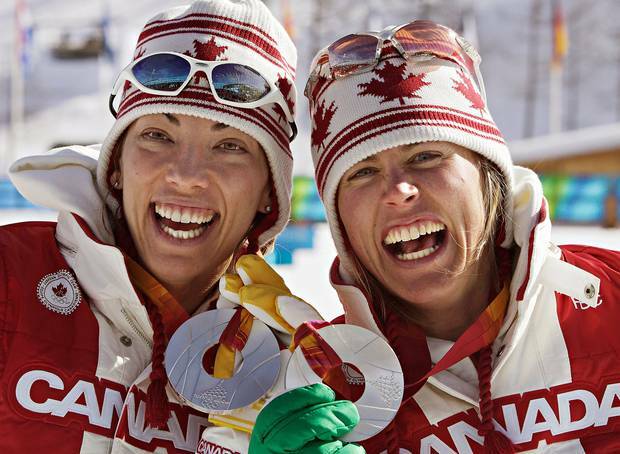 Beckie Scott (left) of Vermillion, Alberta, and Sara Renner of Canmore, Alberta show off their silver medals after winning them in women’s team sprint cross-country skiing competition at the Olympic Games in Pragaleto Plan, Italy on February 14, 2006. Canadian skier Sara Renner was leading the pack in the women's cross-country sprint relay when her pole snapped. A stranger stepped out of the woods and handed her his. She took it, took off and, with Beckie Scott, went on to win the silver medal. The man who had handed over his pole was Norway's coach, Bjørnar Hakensmoen. The team he coached finished fourth – just out of the medals because of his incredible gesture. There was never any question, he later told reporters. It was just the right thing to do. Canadians responded in turn, sending hundreds of letters and phone calls to the Norwegian embassy, as well as a shipment of maple syrup for the Norwegian Olympic Committee. 27 Sep 2000: Kay Poe of the USA makes a kick in the Womens Taekwondo Event during the 2000 Sydney Olympic Games at the Olympic Stadium in Sydney, Australia. This moment didn't happen at the Olympics, but in qualifying. American Esther Kim forfeited a spot on the Olympics so her injured friend, Kay Poe, could compete in what was the first time tae kwon do was a medal event. Poe was the favourite for the gold medal and had dislocated her kneecap in the semi-final. She was scheduled to compete against her close friend Kim, whom she had beaten in an earlier round. Poe insisted on fighting but Kim forfeited, putting Poe on the way to Sydney. 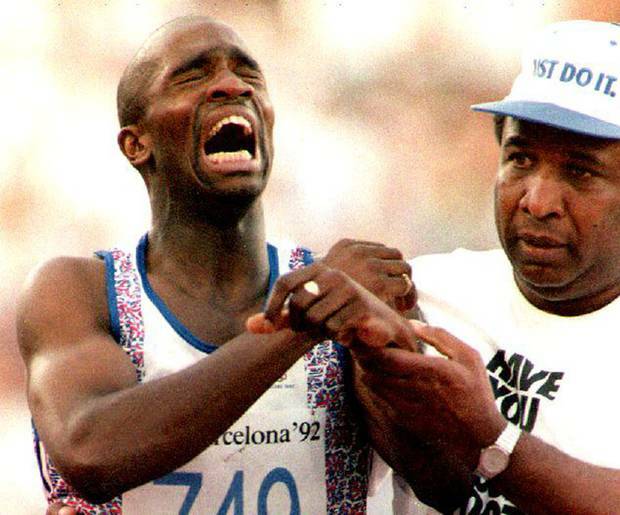 Derek Redmond of Great Britain is helped by an unidentified person in Barcelona, Spain after suffering an injury during a second round heat of the men’s 400-metre run at the 1992 Summer Olympics. In what is regarded as one of the most emotional moments in modern Olympics history, Britain's Derek Redmond was racing in the semi-final of the 400-metres when he tore his hamstring at around the 180-metre mark and crumpled to the ground. As Red Cross workers approached with a stretcher, Redmond got up and began limping his way toward the finish line. That's when his dad, Jim, came out of the crowd to join his son. According to The Guardian, Jim told his son to stop but Derek refused. "'Well then,' the elder Jim said, 'we're going to finish this together.'" As they continued down the track, they had to push off officials who tried to get them to stop. The crowd went wild, cheering a tearful Redmond and his father on all the way to the finish line. Canadian yachtsman Lawrence Lemieux in training in 1988. The International Olympic committee awarded his bravery for plucking a fellow competitor from the sea during a race. He was also awarded second place in the race despite finishing 21st. He finished 11th overall. Possibly the most famous act of sportsmanship by a Canadian came in the 1988 Summer Games when Canadian sailor Lawrence Lemieux abandoned his race to help two fellow sailors in trouble. The Singeaporean duo Joseph Chan and Siew Shaw Her, sailing in an adjacent race, had capsized in the 35-knot winds and were injured. Lemieux, who was in silver medal position at the time, left his race and rescued them amidst high waves, waiting until a patrol boat could come take the sailors back to shore. He rejoined his own race, placing 22nd. Taking into account his actions, officials restored him to second place in the round. Lemieux was also given the Pierre de Coubertin Medal, awarded to people who exemplify the spirit of sportsmanship in Olympic events, the first Canadian bestowed with that honour (just 17 people have won the medal since its creation in 1964).